Goose Fair, the world’s oldest travelling fair, dates back more than 700 years and still thrives today for five days each October on the Forest recreation ground. 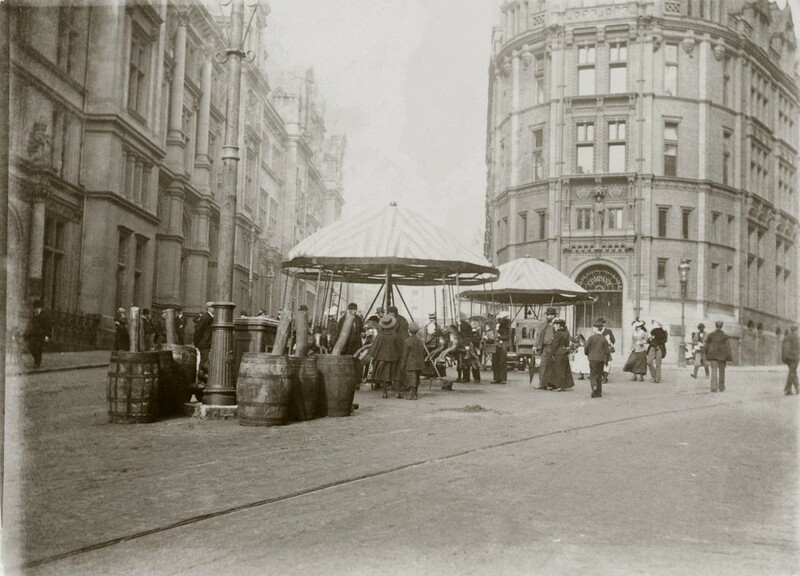 While the fair has undergone many changes over the years, arguably the most traumatic was its removal from the Old Market Square site in the 1920s – a move which many predicted would spell the fair’s decline. Protesters included local councillors and journalists as well as the fair’s showmen and fairgoers. While in retrospect those fears were ill-founded, at the time there were genuine reasons to fear for the Fair’s future. The market square covers some five and a half acres, and is now the largest provincial market square in England, and among the largest in Europe. It was established by William Peverill in the eleventh century and was still hosting the town’s regular markets on the site in the early twentieth century. The old Exchange building (visible at the far end of the marketplace in the photograph) was erected at the square’s eastern end 1724 and remained there into the early decades of the twentieth century. During the nineteenth century it had been used as the council’s administrative offices, along with the Old Guildhall on Weekday Cross. However, after the building of the new Guildhall on Burton Street in 1888, the Exchange was reduced to subsidiary status so far as its municipal purposes were concerned. Its ground floor contained a meat market, The Shambles (the ground floor of today’s Exchange Buildings on the same site are similarly used for retail purposes). A suggestion to knock down and rebuild the Exchange was first considered seriously in 1899. However, it wasn’t until the 1920s that sufficient impetus for the redevelopment of the buildings gathered pace. For when Nottingham’s proposed boundary expansion was rejected due to the city’s poor record in housing and health, the erection of new – and hopefully prestigious – civic offices became an intrinsic part of Nottingham’s ambitious plans for the modernisation and improvement of services. the position really is that there are some members of the City who are much interested in the new Exchange who think that when the Arcade is made they can lift everybody out of the Market, clear it, and make it a garden. [Goose Fair is] so famous an institution that not even the claims of modernity and progress can prevail against it. 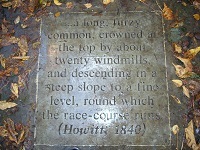 Frequently it has been suggested that the fair should be moved to the Forest or even further afield, but the public opinion is too strong to permit such an idea being entertained, and the first week in October never fails to bring a revival of the old carnival in the very heart of the city. But despite the Fair’s claims as an enduring institution and tradition, it is worth reminding ourselves the fair was constantly innovating. Indeed, by the early twentieth century, novel rides and mechanical innovations had become an essential aspect of the Fair each October. Other aspects of the Fair had often been in flux. 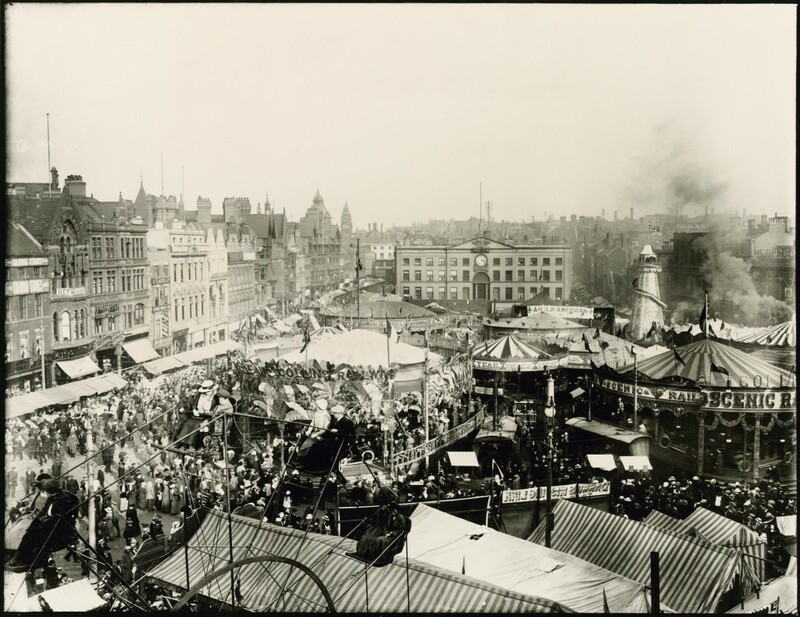 In 1800, for example, the fair was shortened from eight days to just three days and by the end of the nineteenth century the Fair had been transformed from its original role as a Michaelmas food and livestock fair to a funfair. Moreover, as the fair expanded with its new rides and attractions, by the twentieth century it began to outgrow the market area and spread into the surround streets sometimes bringing traffic to a standstill. Such developments were not to everyone’s liking. For example, one Evening Post journalist insisted that Goose Fair had become simply “pandemonium”, although he did acknowledge that the Fair was still capable of providing young people with “some innocent fun”. will next year see the last of Nottingham Goose Fair? The much-debated point will certainly arise again with the completion of the new Exchange. the Fair will become a nuisance, I’m sure … I feel that whilst the Fair has undoubtedly been a happy interlude for a good many thousands of people in the past, the conditions today are vastly changed from what they were even just prior to the war. It will mean that these people cannot come into the city for their legitimate business and they will probably be diverted to outside sources … All these people will be put to tremendous inconvenience if Goose Fair is allowed to go on and interfere with their business for three or four days in the week. all the retailers, hotel-keepers, and others who have made arrangements to do business with these fresh people will have their plans put out of gear.